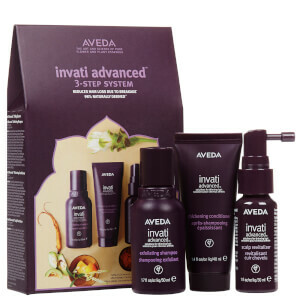 Restore and revitalise thinning hair with the Aveda Invati Advanced 3 Step Set, a trio of nourishing products that works to cleanse, volumise and soothe tired hair and scalps. Treat your hair to a lightweight, sulphate-free formula that works to cleanse, exfoliate and renew the hair and scalp. Restore strength and improve vitality with a thickening formula infused with a blend of Guar, Palm and Grapeseed-derived ingredients. Ideal for thinning hair, its densiplex™ complex synergises Turmeric and Ginseng to boost elasticity and minimise breakage, revealing healthy-looking locks from root to tip. Kukui Nut Oil enhances luminosity so you can experience voluminous, fuller hair and revived radiance. 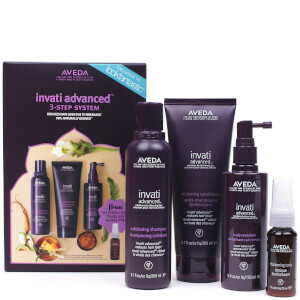 Treat thinning hair to an innovative treatment that works to create an optimal scalp environment for healthy hair growth. The densiplex™ complex combines Ayurvedic herbs, Turmeric and Ginseng to energise hair follicles, whilst Vitamin E boosts micro-circulation when massaged in. Suitable for use on damp or dry hair, the powerful formula helps to reduce breakage and hair loss, leaving you with a thicker, fuller-looking appearance and stronger strands from root to tip. Shampoo: Water\Aqua\Eau, Cocamide Mipa, Sodium Chloride, Sodium Methyl Cocoyl Taurate, Sodium Cocoyl Isethionate, Babassuamidopropyl Betaine, Carthamus Tinctorius (Safflower) Oleosomes, Disodium Laureth Sulfosuccinate, Propanediol, Curcuma Longa (Turmeric) Root Extract, Emblica Officinalis Fruit Extract, Panax Ginseng (Ginseng) Root Extract, Vitis Vinifera (Grape) Seed Extract, Phyllanthus Emblica Fruit Extract, Silybum Marianum (Lady's Thistle) Extract, Panicum Miliaceum (Millet) Seed Oil, Rosmarinus Officinalis (Rosemary) Leaf Extract, Hydrolyzed Soy Protein, Aleurites Moluccana (Kukui) Seed Oil, Glycerin, Salicylic Acid, Acetyl Carnitine Hcl, Guar Hydroxypropyltrimonium Chloride, Ethyl Macadamiate, Malt Extract, Adenosine Phosphate, Creatine, Yeast Extract\Faex\Extrait De Levure, Butyl Avocadate, Dipotassium Glycyrrhizate, Sodium Lauroamphoacetate, Stearamidopropyl Dimethylamine, Gluconolactone, Cetrimonium Chloride, Fragrance (Parfum), Citral, Geraniol, Linalool, Citronellol, Eugenol, Limonene, Citric Acid, Potassium Sorbate, Phenoxyethanol, Sodium Hydroxide. Conditioner: Water\Aqua\Eau, Cetearyl Alcohol, Cetyl Alcohol, Methyl Soyate, Behentrimonium Methosulfate, Curcuma Longa (Turmeric) Root Extract, Emblica Officinalis Fruit Extract, Panax Ginseng (Ginseng) Root Extract, Punica Granatum (Pomegranate) Seed Oil, Perilla Ocymoides Seed Extract, Sisymbrium Irio Seed Oil, Vitis Vinifera (Grape) Seed Extract, Phyllanthus Emblica Fruit Extract, Centella Asiatica (Hydrocotyl) Extract, Silybum Marianum (Lady's Thistle) Extract, Panicum Miliaceum (Millet) Seed Oil, Rosmarinus Officinalis (Rosemary) Leaf Extract, Caffeine, Glyceryl Caprylate, Hydrolyzed Soy Protein, Aleurites Moluccana (Kukui) Seed Oil, Hydrogenated Olive Oil Unsaponifiables, Hydrogenated Ethylhexyl Olivate, Dihydroxypropyl Arginine Hcl, Guar Hydroxypropyltrimonium Chloride, Ethyl Macadamiate, Tapioca Starch, Malt Extract, Adenosine Phosphate, Creatine, Yeast Extract\Faex\Extrait De Levure, Cetrimonium Chloride, Dibutyl Adipate, Fragrance (Parfum), Citral, Geraniol, Linalool, Citronellol, Eugenol, Limonene, Potassium Sorbate, Phenoxyethanol. Scalp Revitalizer: Alcohol Denat., Water\Aqua\Eau, Dipotassium Glycyrrhizate, Curcuma Longa (Turmeric) Root Extract, Panax Ginseng (Ginseng) Root Extract, Glycyrrhiza Glabra (Licorice) Root Extract, Centella Asiatica (Hydrocotyl) Extract, Camellia Sinensis (Green Tea) Leaf Extract, Saccharomyces Lysate Extract, Chlorella Vulgaris Extract, Rosmarinus Officinalis (Rosemary) Leaf Extract, Glucosamine Hcl, Adenosine Phosphate, Tocopheryl Nicotinate, Tocopheryl Acetate, Arginine, Caffeine, Salicylic Acid, Yeast Extract\Faex\Extrait De Levure, Aleurites Moluccana (Kukui) Seed Oil, Hydroxypropyl Methylcellulose, PEG-40 Hydrogenated Castor Oil, Hydroxypropylcellulose, Fragrance (Parfum), Citral, Geraniol, Linalool, Farnesol, Benzyl Benzoate, Benzyl Salicylate, Citronellol, Coumarin, Eugenol, Limonene.